Zebra bread is one of local bread labels available only on Okinawa. Most of people living on the island have eaten it least a once. It has brown sugar flavor and peanut butter cream between layers of dough. Okiko Co, Ltd. started to bake the bread about 30 years ago by accident, when one of their workers spread peanut butter cream in between a heel of bread. The taste was good and this was the beginning of Zebra bread. When you cut the bread, it looks like a zebra with its stripes giving it its name. 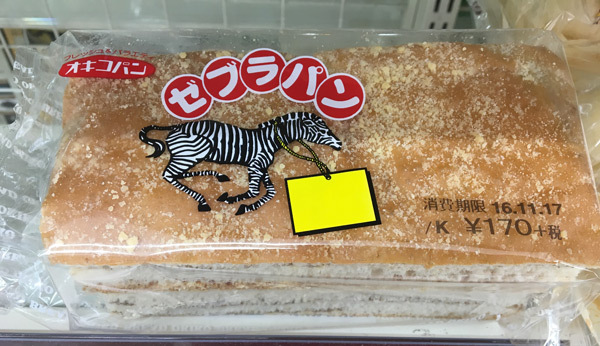 Zebra bread is sold in convenience and grocery stores throughout Okinawa.